Influenced by metal and punk in the late 80s and 90s, the musical progression for Robert Dietz from hip-hop, drum and bass to techno and house was a journey. Having grown under the umbrella of Loco Dice, he has quickly developed his own unique style which blends smoothly minimal house, techno or Detroit-Chicago old-school house. With a label of his own, releases on labels such as Cadenza, Running Back, Cecille, Saved Records and gigs at the most important spots in the underground scene, he is clearly a name that cannot be ignored. 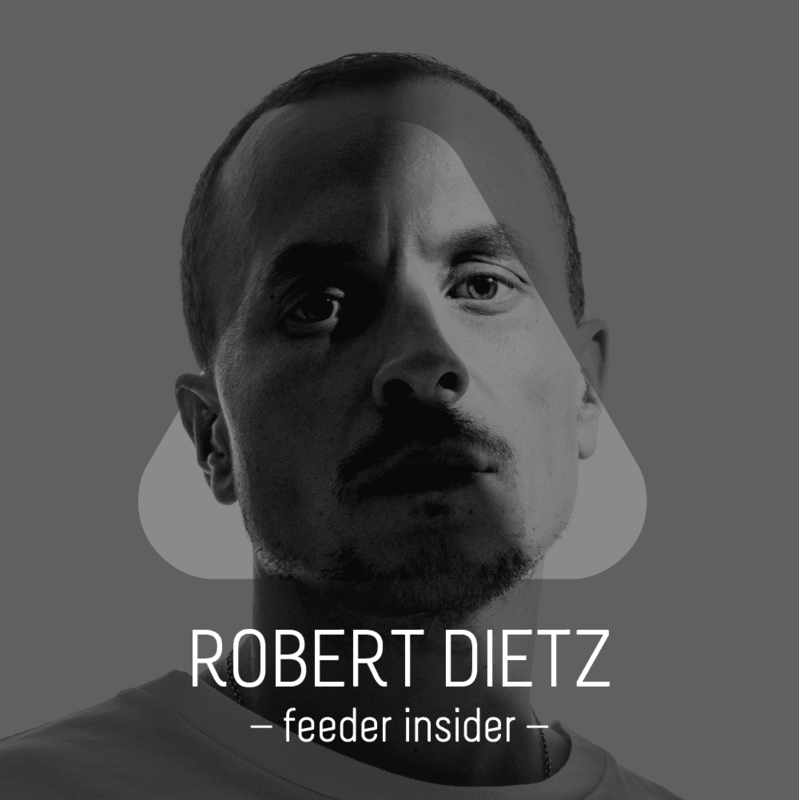 Anticipating a crazy night with Robert Dietz at INSiDE Festival NYE 2017, we’ve talked about Romanian scene, motivation, and social media. When I was a child… I still am! In Frankfurt I often go to… To my favorite record store Gosu. The best meal I ever had… Was for my 30th birthday in Tokyo. The most used app on my phone… Definitely iTunes! My mom always told me… You’ve got to earn your spot, it’s not given! Vlad Dumitrescu: Hello, Robert! We’re happy that we have the chance to talk to you on the feeder insider series. How has 2016 been so far? What were the best moments and what are you looking forward to in 2017? Robert Dietz: 2016 has been quite interesting for me as I was constantly working on my sound and shaping it in the studio and in my DJ sets, kind of readjusting my vision of where I want to be as an artist and what I want to represent with my music. Best moments are always when you are satisfied with your work, when you are able to touch people with what you are doing. Especially when all this energy you put into it comes back. Regarding 2017 I’m looking forward to building up more of my own label and release more music on other platforms too. VD: This year you visited Romania several times, most recently at Arad where you played for ABC at the airport. How did you feel playing in an airport and what is your impression of the Romanian public? RD: Playing in Romania is always a pleasure, we all appreciate the huge scene over there with so many interesting and genre-defining artists. People are really deep into the music and enjoying themselves and parties in general. Playing at an old airport inside a hangar was something I never did before. I was a bit skeptical about the sound situation but it turned out to be a very good gig with a very special vibe. Altogether a great festival run by really dedicated nice people. VD: In 2015 you launched your Berlin based record label – Truth Be Told. It’s a joint venture between you and your friend, Hendrick Schneider, who takes care of the visual part. You said that design is a key element for you when picking out records in a store, so how do you work together with Hendrick when it comes to releases on TBT? Does the artwork come before or after the tracks are ready? RD: Well, it’s not the only key element of course, maybe I said that in a wrong way, but when it comes to digging records from labels or artists I don’t know I tend to look at the artwork and when it’s catching my attention it’s more likely I pull the record out of the shelve and give it a listen. Our own artwork is always done after the music is ready. We usually have a couple of tracks and decide together what we’d like to put out after that Hendrik starts working on an artwork. But his inspiration mainly comes from his other work as a photographer and an art director. VD: What gear do you use when creating a track? What would we find in your studio if we stopped by? RD: There is no go-to machine when it comes to creating. I tend to jam around with all different kind of things, outboard equipment, samples, and plug-ins. I tend to get bored pretty fast so I’m always changing my gear and starting to work from different angles. VD: Your trademark is that you blend in different styles perfectly: minimal house, techno or Detroit-Chicago old-school house. What made you have this approach? RD: It’s simple, I like too much different stuff and I don’t want to just get stuck in one genre. There is so much good music out there, it would be a shame to not play it out. I try to see it from the other side, when I’m on the dancefloor listening to a DJ, of course, I need the energy and the hypnosis, but also the moments when something unexpected comes in that brings everything to another level. VD: You released on labels such as Cadenza, Running Back, Cecille, Saved Records and others. What keeps you motivated and what are your long-term goals in the future? RD: The motivation is to become better and better in what I’m doing every day, no matter if it comes to music or being a better human being. It’s important for me to progress constantly and also being hungry for inspiration and share my visions. Also to be able to express myself through music and make people happy with it. On the long term, it is important for me to run a healthy career with longevity. VD: Nowadays, more and more people start their careers as DJs because it is, without any doubt, easier than it was before. Despite all of this, few of them make it to the top. What piece of advice do you have for someone at the start of her or his career? Stay true to yourself, realize what and why you want to achieve something. It should be for the belief in the music and yourself only and not for material things or fame and to also be dedicated and consistent. VD: You said that you are a big fan of vinyl but you don’t carry wax with you because it is inconvenient and that most clubs don’t offer the right conditions for vinyl to be played. Why do you think clubs do that, bearing in mind that vinyl sales are up? RD: I’m still traveling with records every weekend but I barely get to play them as mentioned. Vinyl sales might be up due to people more and more collecting records again but most DJs prefer to go the convenient way of traveling and playing safe. VD: Do you follow the Romanian underground scene? Can you name an artist that you like or with whom you plan to collaborate in the future? RD: I follow the scene of course and as said before already, there is so much great talent coming from there. Some of the artists I really like are Suciu, Costin Rp or Hansel for example but there are so many others. There aren’t any collaborations planned, though. VD: Robert Johnson is a very special club for you and it’s always a pleasure to play there. What changes when you play a festival like BPM, for example, as opposed to Robert Johnson? Where do you like it more and why? RD: Both situations have their advantages, there’s no winner or looser. A club like Robert Johnson is very intimate and it’s easier to experiment with sound. You are close to the people, it’s like playing for friends. The festivals have another kind of vibe due to the bigger audiences and stages with their overwhelming energy. Both make me smile! VD: You said that social media could be boring. More and more DJs are connected with their fans via Facebook, Twitter or SoundCloud. How do you see the social networks influencing the underground scene in 2016? What about the future? RD: It’s a difficult topic and I’m constantly having a battle with myself about “playing this game” or not. Brett Johnson wrote a quite interesting essay about it on xl8r. I feel like it’s part of the job nowadays to be present 24/7 and constantly trigger people’s attention as all of our attention span got so short due to the same platforms we are trying to feed every day. Almost a vicious circle for us. There are so many artists out there who are really good in keeping their socials lively and interesting but also so many insubstantial hypes are only created through this communication channels, that it’s rather a positive development.